Mora clocks are a type of longcase clock which were made in and named from the town of Mora, Sweden in the Province of Dalarna around 1750. Production began in the late 18th century and continued through most of the 19th finally succumbing to the increased competition from newer styles and mass production methods due to their popularity. Poor farming conditions forced the farmers in the Mora area to look for other ways to supplement their income. The villagers of this area turned to traditional home crafts, the building of wall clocks and tall case clocks. Each family specialized in a certain part: some made the brass clockworks, some painted the faces, while others built or painted the tall case clocks. Just like an assembly line, the workers became very skilled and did excellent work. Howard Miller has just introduced two new reproductions of the Mora Clocks that capture the style of a Mora clock but using digital electronics to power the clock’s timekeeping, swinging pendulum and chimes. These are thin-line clocks that do not take up much space from the wall as the depth is only 11 1/4″. 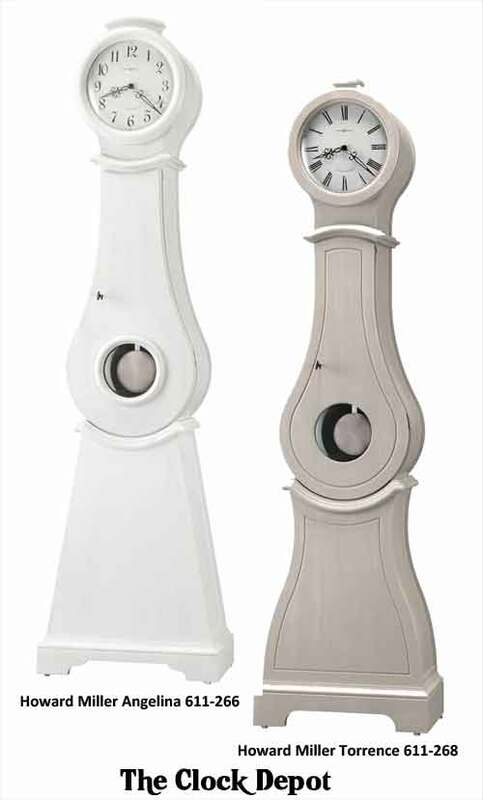 These clocks have an aged appearance that is achieved through spatter marks, the use of a rasp, and well-placed dents. The Antique Grey finish features white undertones. These new Mora style reproductions use a digital movement that will play three different chime melodies which include, Westminster, Ave Maria, and Bim Bam chimes. The Westminster chime may pay hourly only followed by an hour count or they may also be set to play hourly and quarter hour. The pendulum swings and the round disc may be seen swinging through the round pendulum window in the body of the clock. There is also an automatic night-time chime shutoff feature which will turn the chimes off during the evening hours or you may select for them to play 24 hours. A volume control determines the loudness of the chime. Select one of the links below to see these new clocks and pricing. Both of these clocks are part of Howard Millers New 91st Anniversary Editions of floor clocks for this year. These are now on sale at The Clock Depot and includes Free In-Home Delivery anywhere within the upper 48 States.